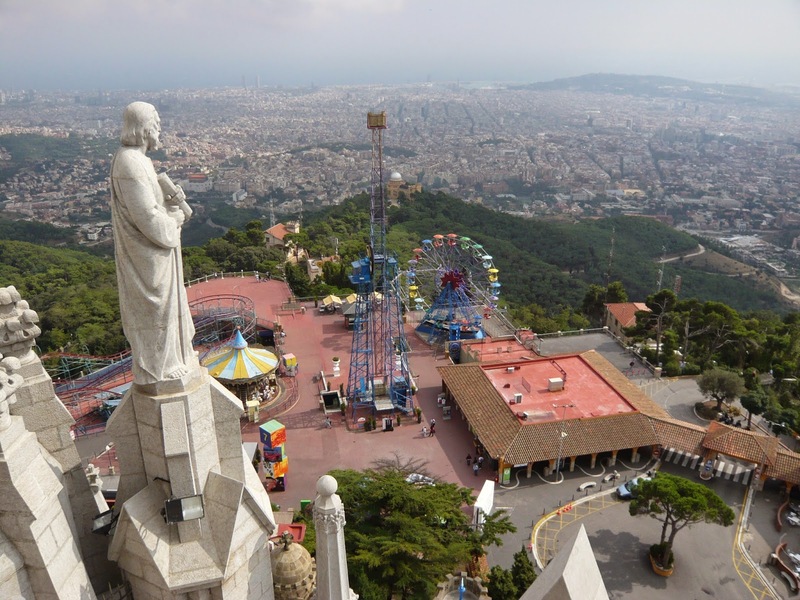 With its unique Barcelona city scenery and its enjoyable amusement park, Tibidabo Mountain is one of the best places to visit in Barcelona. For nature and joy passionates, Tibidabo Mountain really offers its visitors fascinating view of the city from the sky. For touristic attractions in Barcelona city, it generously offers many magical places for visitors. In Tibidabo mountain, on the top you can see the colorful wheel in the amusement park but you should note that this park is not open everyday or season. It is generally at service at weekends. For hiking in Tibidabo mountain you may want to wait for the right weather conditions but if you don't have time then you can watch the sunset from the mountain. If the weather is clear than seeing the great air view of the city, you will be suprised how beautiful the landscape is. Beside the scenery and amusement park, you will have chance to visit a telecommunication tower and the church called Temple De Sagrat Cor which is also a catholic church as usual and a copy of Sacre Couer in Montmartre, Paris. All these places in Tibidabo Mountain can be seen from the city inside as Tibidabo Mountain is the highest of all in Serra de Collserola. On the top of the Catholic church whose construction was lasted 60 years, there is a sculpture of Sacred Heart of Jesus. Some ridings in the amusement park have been dated to 20th century and the park was featured in Woody Allen's movie named Vicky Christina Barcelona. If you wonder about the transportation options, you can reach Tibidabo Mountain by funicular, railway, buses, bikes or by car. We highly recommend you to use funicular which gives you colorful journey to the top. So how do you get to Tibidabo Mountain? You can take L7 subway till Avinguda del Tibidabo Then change into Tramvia Blue and lastly get into cog railway to Tibidabo mountain or alternatively you can use Tibibus from Plaça de Catalunya which takes for every 20 minutes. For better Barcelona holiday plan please follow Barcelona city guide. Thanks for commenting on our posts. If you wonder about anything else about Barcelona city, you can inform us and we will try to do our best. See you in the next article. For video thanks Tibidabo Best Views. Had not even heard of Tibidabo Mountain when I went to Barcelona. Looks like it has some awesome views - thanks for sharing!